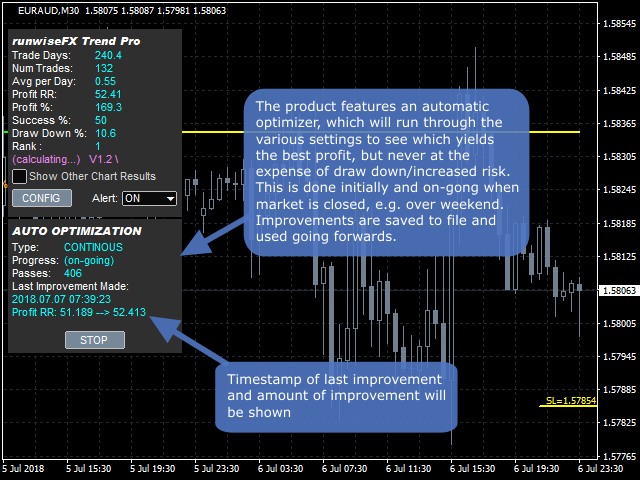 The automatic optimization will examine chart history to fine tune indicator inputs as well as stop loss, take profit/exit regime, filters, trading hours, upper timeframe checks and other factors. The optimization takes place initially and then on-going when the market is closed. 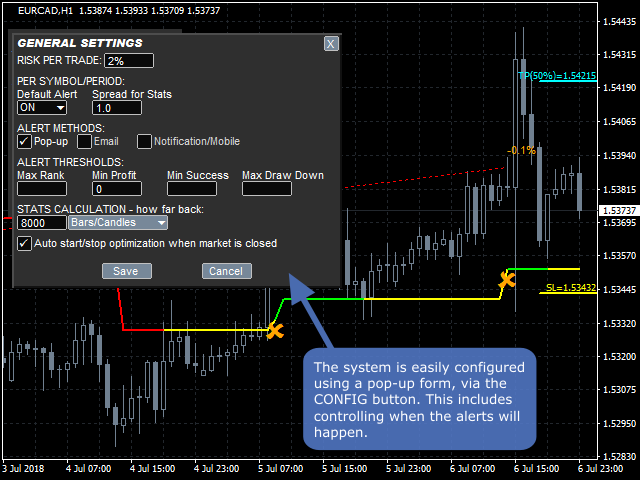 This is all automatic without having to use the strategy tester and works on multiple charts at the same time. Optimized settings are saved to file for if MetaTrader is restarted. The optimization looks for the most profitable settings without increased risk/draw-down. When an improvement is made it will be reported on the panel and automatically adopted. The indicator can be used on any timeframe or symbol but for currency pairs it has an additional filter to check currency strengths of the pair. There is also a mode for Binary Options, although we recommend regular spot/market trading. 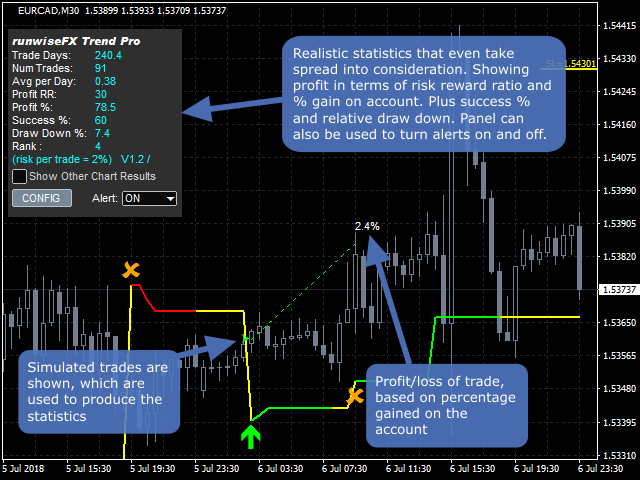 Please see the screenshots and video below to see the indicator in action. 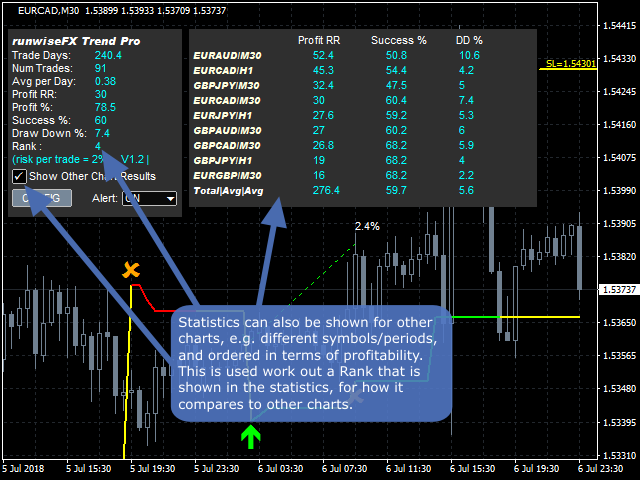 When the indicator is first added to a chart, for a symbol/period not added before, it will go through an initial optimization process. Please allow this to finish. 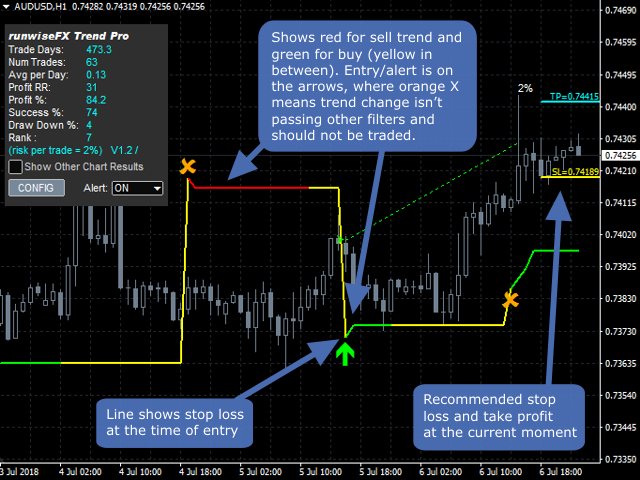 The indicator alerts recommend entries. Those entries are shown as arrows on the chart with recommend stop loss and take profit lines, marked SL and TP, respectively. A manual is available in the comments section. Main_binaryOptionRiskRewardRatio - if in Binary Options mode then will be the value of risk reward ratio for the stats. Should match what your broker gives you. Main_minTradesPer1000Bars - minimum trades allowed per 1000 bars when optimizing. Used to prevent success relying on a few trades with rare setups that might not be seen again. Main_statsDateEnd - can be set to a date in yyyy.mm.dd format for which stats is produced over. Gives end date of range. The indicator is compatible with our Strategy Automator EA product that allows indicators to be converted into an EA that can trade automatically (see video). This includes taking news events into consideration and has a hidden/virtual stop loss and take profit. This EA auto optimize the various pairs during weekend and chooses the top pairs to trade into based on the updated results. I have never seen any other EA on the market which is able to provide such amazing functionalities. This is a true set and forget EA which always automatically re-adjusts itself with the current market situation. Definitely deserve a 5 star review for me. I got this latest version and it really blow my mind, very pro coding and fully automatic optimizer. I have a fully paid version, quite expensive, and though at times it makes good trades, it loses massive in the long run. As usual im dissapointed and cant seem to find a product that trades successfully. I guess the only way to trade is manually, only, as I struggle with time as I am in full time employment. I use this with Configurable Strategy Automator. Cheers!